We are a small jobs specialist focussed on getting the job done for you at the right price. Our aim is to make it easier for home owners and tenants to find a reliable handyman service near them. We have many talented handymen and skilled trades on demand that cover most areas of London. We like to take on all types of house repairs and property maintenance and give helpful advice to our clients. We try to reduce the everyday stress levels that most people get when something goes wrong around the house. The handyman repair therapy starts when you call us to explain your problem, and we to listen to you and send out the right field worker to solve your problem. You need a handyman service, and HandyOz is here to help you. We have multi-talented handymen, and skilled trade workers to do all types of home repairs, small jobs and odd tasks. Hire our skilled workers by the hour or pay fixed price. 07570 668 845 Call for a free quotation today. HandyOz is a top-rated company in London for same day handyman service and responds fast for all types of small home repairs and maintenance. 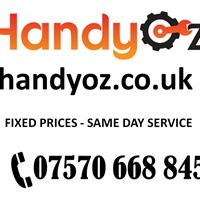 If you need a highly reviewed handyman in London, then HandyOz is the right choice. We do every day small tasks, odd jobs and general house repairs. Our highly skilled Handymen, Electricians, Plumbers, Painters and Carpenters ready to serve your local area. We offer free quotations, fixed price jobs and same day handyman service. Book handyman service by phone or online.